and rescue and adoption of stray or unwanted animals living on nearby reservations. Native American reservations in the Tucson area are ravaged by the effects of pet overpopulation and poverty. Dogs and cats in these areas suffer from mange, tick and valley fever, and parvovirus. Animals’ Crusaders volunteers make frequent visits to nearby reservations to provide food & water, free mange and tick dips, vaccination and spays/neuters. For many, these trips offer the only access to veterinary care for their animals! There are no other humane animal services provided for that area. Animals’ Crusaders learn about strays and unwanted animals during volunteer trips to the reservations and we rescue as many animals as we can. All rescued animals are provided with any necessary veterinary care, nursed back to health, socialized and put up for adoptions. If you would like to meet a particular dog please contact us first and we can make sure that dog is available at our next adoption day. You can also meet any of our dogs by appointment, please Contact Us and we can set up a time that is convenient for you. Animals’ Crusaders is an all volunteer, non-profit (501c3) corporation. Without donations from the public we would not be able to continue our rescue efforts. This is Fluffy. She's been missing since January 30th. Shes a Himalayan Snowshoe. Long white fur with blue-grey striped siamese markings. Big blue eyes, loud whiney voice & she's a "talker". Ive had hersince the day she was born & she's now 10 years old. IM MISSING A PART OF MY FAMILY!! She's REAL good at hiding, but shes very friendly. She's BEAUTIFUL, so I think someone may have taken her in. $100 CASH REWARD TO ANYONE WHO BRINGS HER HOME SAFE! PLEASE. Animals Crusaders of Arizona shared a post. 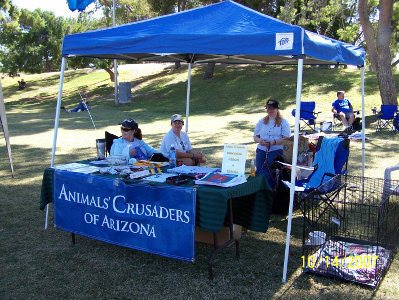 Animal's Crusaders of Arizona | Powered by Mantra & WordPress.